Abigail Judah, born 1742; died 1819 at Richmond, Va. ("Publ." vi. 111); Abraham Judah, son of Hillel Judah; born July 15, 1774 (ib. xi. 155); Andrew Judah, mentioned in the "South Carolina Gazette," Dec. 31, 1764, as "a physician from London" (see B. Elzas, "Jews of South Carolina," ii. 12, Charleston, 1903); Andrew Judah, of Indiana; served in the Civil war (S. Wolf, "The American Jew as Patriot, Soldier, and Citizen," p. 412); Anna Judah, daughter of Naphtali Judah; died in New York 1822 ("Publ." iv. 208); Baran Judah, enrolled in the New York militia company in 1738 (ib. ii. 92). Mentioned under date of Jan. 10, 1715-16, as one of the freemen of New York (ib. vi. 101); one of the signers of a petition addressed to the mayor and board of aldermen in New York praying permission to use ground purchased for a cemetery, Aug. 23, 1728 (comp. ib. iv. 196; vi. 127, 131). A Baruch Judah is also mentioned as one of the electors at a congregational meeting of the Spanish-Portuguese synagogue in New York. He died Jan. 12, 1774, aged 95 years (comp. ib. xi. 154). Another Baruch Judah was one of the charter members of Congregation Beth Shalome, Richmond, Va. (comp. ib. iv. 21, xi. 72), cited in its minute-book, 1791; was born June 21, 1763; died in Richmond, Va., Sept. 26, 1830 (comp. ib. xi. 154). 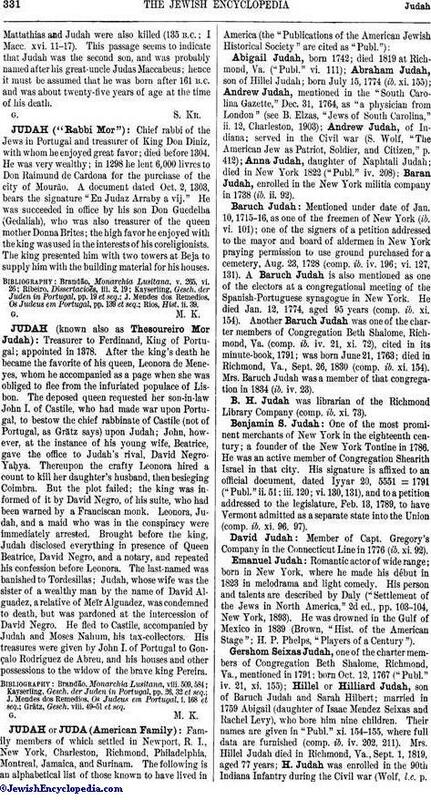 Mrs. Baruch Judah was a member of that congregation in 1834 (ib. iv. 23). B. H. Judah was librarian of the Richmond Library Company (comp. ib. xi. 73). One of the most prominent merchants of New York in the eighteenth century; a founder of the New York Tontine in 1786. He was an active member of Congregation Shearith Israel in that city. His signature is affixed to an official document, dated Iyyar 20, 5551 = 1791 ("Publ." ii. 51; iii. 120; vi. 130, 131), and to a petition addressed to the legislature, Feb. 13, 1789, to have Vermont admitted as a separate state into the Union (comp. ib. xi. 96, 97). Member of Capt. Gregory's Company in the Connecticut Line in 1776 (ib. xi. 92). Romantic actor of wide range; born in New York, where he made his début in 1823 in melodrama and light comedy. His person and talents are described by Daly ("Settlement of the Jews in North America," 2d ed., pp. 103-104, New York, 1893). He was drowned in the Gulf of Mexico in 1839 (Brown, "Hist. of the American Stage"; H. P. Phelps, "Players of a Century"). Gershom Seixas Judah, one of the charter members of Congregation Beth Shalome, Richmond, Va., mentioned in 1791; born Oct. 12, 1767 ("Publ." iv. 21, xi. 155); Hillel or Hilliard Judah, son of Baruch Judah and Sarah Hilbert; married in 1759 Abigail (daughter of Isaac Mendez Seixas and Rachel Levy), who bore him nine children. Their names are given in "Publ." xi. 154-155, where full data are furnished (comp. ib. iv. 202, 211). Mrs. Hillel Judah died in Richmond, Va., Sept. 1, 1819, aged 77 years; H. Judah was enrolled in the 90th Indiana Infantry during the Civil war (Wolf, l.c. p.178); Isaac Judah, no doubt the same as Isaac H. Judah, officially connected with the congregations Shearith Israel in New York and Beth Ahaba in Richmond (comp. "Publ." iii. 120; iv. 21, 22; vi. 131; xi. 154; E. Calish, "Hist. of Congregation Beth Ahaba, Richmond, Va., 1841-1901," p. 8, Richmond, 1901), was born July 10, 1761 ("Publ." xi. 154); Israel Judah, served in Company F, 31st Indiana Infantry, during the Civil war (Wolf, l.c. p. 178); Jacob Judah, mentioned in 1658 as one of the early settlers at Newport, R. I. ("Publ." vi. 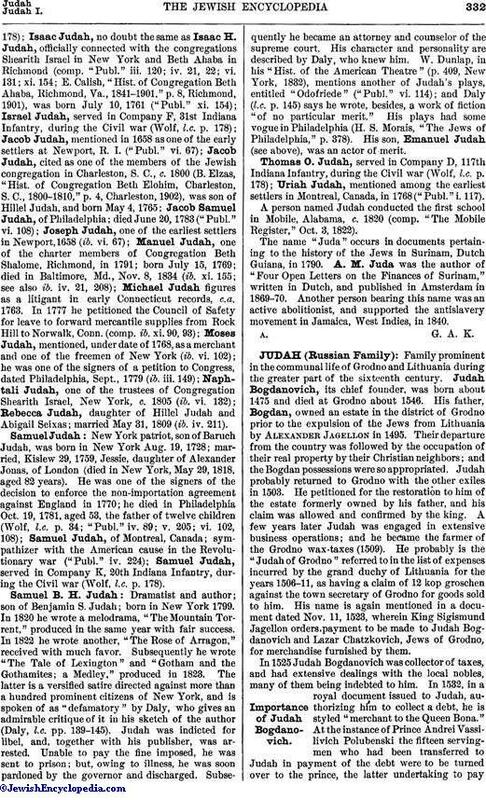 67); Jacob Judah, cited as one of the members of the Jewish congregation in Charleston, S. C., c. 1800 (B. Elzas, "Hist. of Congregation Beth Elohim, Charleston, S. C., 1800-1810," p. 4, Charleston, 1902), was son of Hillel Judah, and born May 4, 1765; Jacob Samuel Judah, of Philadelphia; died June 20, 1783 ("Publ." vi. 108); Joseph Judah, one of the earliest settlers in Newport, 1658 (ib. vi. 67); Manuel Judah, one of the charter members of Congregation Beth Shalome, Richmond, in 1791; born July 15, 1769; died in Baltimore, Md., Nov. 8, 1834 (ib. xi. 155; see also ib. iv. 21, 208); Michael Judah figures as a litigant in early Connecticut records, c.a. 1763. In 1777 he petitioned the Council of Safety for leave to forward mercantile supplies from Rock Hill to Norwalk, Conn. (comp. ib. xi. 90, 93); Moses Judah, mentioned, under date of 1768, as a merchant and one of the freemen of New York (ib. vi. 102); he was one of the signers of a petition to Congress, dated Philadelphia, Sept., 1779 (ib. iii. 149); Naphtali Judah, one of the trustees of Congregation Shearith Israel, New York, c. 1805 (ib. vi. 132); Rebecca Judah, daughter of Hillel Judah and Abigail Seixas; married May 31, 1809 (ib. iv. 211). New York patriot, son of Baruch Judah, was born in New York Aug. 19, 1728; married, Kislew 29, 1759, Jessie, daughter of Alexander Jonas, of London (died in New York, May 29, 1818, aged 82 years). He was one of the signers of the decision to enforce the non-importation agreement against England in 1770; he died in Philadelphia Oct. 19, 1781, aged 53, the father of twelve children (Wolf, l.c. p. 34; "Publ." iv. 89; v. 205; vi. 102, 108); Samuel Judah, of Montreal, Canada; sympathizer with the American cause in the Revolutionary war ("Publ." iv. 224); Samuel Judah, served in Company K, 20th Indiana Infantry, during the Civil war (Wolf, l.c. p. 178). Dramatist and author; son of Benjamin S. Judah; born in New York 1799. In 1820 he wrote a melodrama, "The Mountain Torrent," produced in the same year with fair success. In 1822 he wrote another, "The Rose of Arragon," received with much favor. Subsequently he wrote "The Tale of Lexington" and "Gotham and the Gothamites; a Medley," produced in 1823. The latter is a versified satire directed against more than a hundred prominent citizens of New York, and is spoken of as "defamatory" by Daly, who gives an admirable critique of it in his sketch of the author (Daly, l.c. pp. 139-145). Judah was indicted for libel, and, together with his publisher, was arrested. Unable to pay the fine imposed, he was sent to prison; but, owing to illness, he was soon pardoned by the governor and discharged. Subsequently he became an attorney and counselor of the supreme court. His character and personality are described by Daly, who knew him. W. Dunlap, in his "Hist. of the American Theatre" (p. 409, New York, 1832), mentions another of Judah's plays, entitled "Odofriede" ("Publ." vi. 114); and Daly (l.c. p. 145) says he wrote, besides, a work of fiction "of no particular merit." His plays had some vogue in Philadelphia (H. S. Morais, "The Jews of Philadelphia," p. 378). His son, Emanuel Judah (see above), was an actor of merit. Thomas O. Judah, served in Company D, 117th Indiana Infantry, during the Civil war (Wolf, l.c. p. 178); Uriah Judah, mentioned among the earliest settlers in Montreal, Canada, in 1768 ("Publ." i. 117). A person named Judah conducted the first school in Mobile, Alabama, c. 1820 (comp. "The Mobile Register," Oct. 3, 1822). The name "Juda" occurs in documents pertaining to the history of the Jews in Surinam, Dutch Guiana, in 1790. A. M. Juda was the author of "Four Open Letters on the Finances of Surinam," written in Dutch, and published in Amsterdam in 1869-70. Another person bearing this name was an active abolitionist, and supported the antislavery movement in Jamaica, West Indies, in 1840.